← New “Prufrock” pages coming up! In addition to the great honour of having one’s image featured on the cover, the winner will receive a 1000 euro cash prize and a flight to Milan to attend the launch of the book, an event which will take place as part of the Expo Milano World’s Fair in June of this year. The image represents a row of poplar trees at the edge of a river –a common sight along the banks of the Po River and its tributaries, including the many waterways that once flowed through what is now the metropolitan region of Milan. 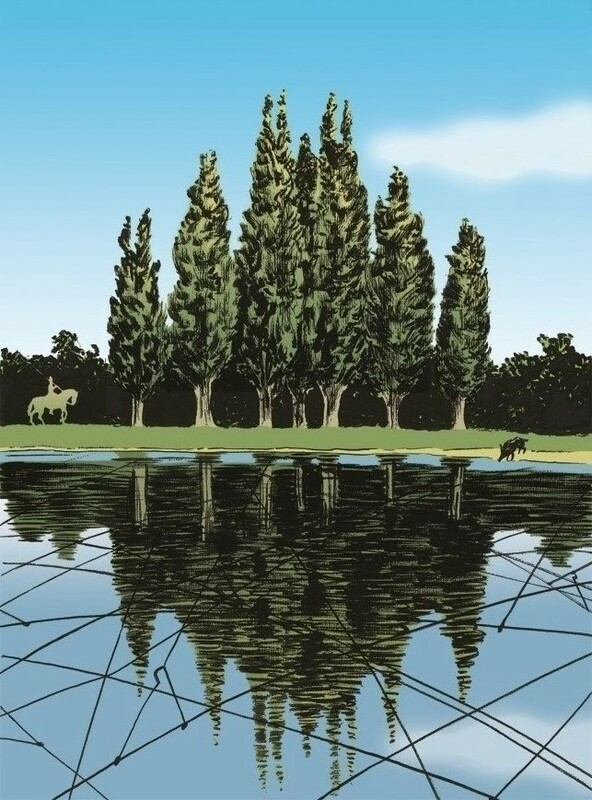 The rows of poplars are reflected in the water, where they form a reverse image of the façade of the Duomo cathedral, Milan’s most iconic structure. Also reflected in the water are the electric wires of the Milan tram system, which crisscross the modern Milanese’s view of the sky from street level. On the right side of the image, along the riverbank, a wild boar has come to drink. The wild boar was the tribal totem of the Aedui, one of the original Celtic peoples who are said to have founded Milan, and a woolly wild boar sow (the scrofa milanuta) was an early symbol of the city. In the context of this image, the boar also stands as an embodiment of the primeval wilderness of the Po valley. Approaching on the left is a rider with a spear resting on his shoulder -a hunter with his sights on the drinking boar. The depicted encounter can therefore be seen as a condensed manifestation of humanity’s tendency towards the destruction of its natural environment. This entry was posted in comics, illustration and tagged beniamino delvecchio, duomo, expo milano 2015, fumetto, medhelan graphic novel, medhelan international cover contest, parco nord milano, pioppi, poplars, silvio da rù, star comics. Bookmark the permalink. C’est brillant, simple et subtil, le crisscross des fils d’alimentation des trams, l’ombre de la cathédrale…on admire le chemin méditatif qui a abouti ainsi, mais est-ce que le gris généralisé dans tout ce qui est vivant reflète l’utilisation de la pierre dans la ville? Une pétrification de la vie? Ou la présence de la cathédrale dans le germe de fondation de la ville? C’est des réflections intéressantes. Milan est vraiment une des villes les plus grises qu’on puisse imaginer, quoique son esprit est loin d’etre pétrifiée. Ca bouge plus vite que New York! Having looked at the other entries, yours has a clean straightforward message. It would be my unprejudiced pick.